In food processor with knife blade, pulse chocolate until finely ground. In 1-quart pan, heat cream to boiling. Add cream to chocolate; blend until smooth. Add butter; blend well. Line 9" by 5" loaf pan with plastic wrap. Pour chocolate mixture into pan. Refrigerate until cool and firm enough to handle, 3 hours. Invert chocolate block onto cutting board. Cut chocolate into 24 (or 12 for larger egg-shaped) pieces. Shape each piece into a ball (or oval for eggs). 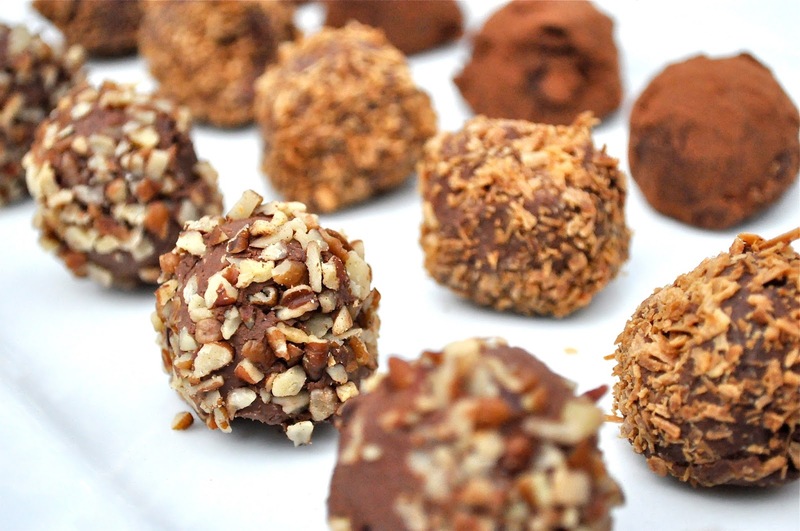 Roll half the truffles in hazelnuts; roll the other half in cocoa. Refrigerate up to 1 week, or freeze up to 1 month. Let stand at room temperature 1 hour before serving.